Hearts overtook Celtic to return to the top of the Scottish Premiership with a commanding display that left Partick Thistle reeling. Pace and power were fundamental to the home side's attacks and they led after a first-half volley from Osman Sow. 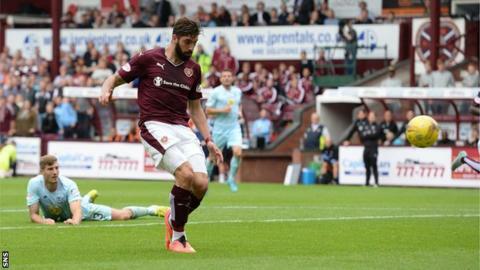 Sam Nicholson and Juanma Delgado added further goals to give Hearts a fifth win from their opening five games. Nicholson converted the rebound after Juanma's penalty had been saved but the striker then chipped in the third. Partick Thistle could barely take their breath at Tynecastle. Relentlessness comes as second nature to Hearts and the challenge for the visitors was to try to stand firm. They did not approach the game with containment in mind and David Amoo, Ryan Stevenson and Kris Doolan were always seeking to be adventurous but the spirited nature of Thistle's display was in trying to hold their lines. The Jags coped well enough in spells during the first half but with Hearts sweeping forward in waves whenever the opportunity arose, chances were inevitable. It was not always assertiveness alone that prevailed, though, and a refined chip forward from Nicholson almost created an opportunity for Juanma. Alim Ozturk then nutmegged an opponent at the edge of the box before Prince Buaben slipped the ball infield for Callum Paterson, whose shot was deflected wide. Partick Thistle eventually succumbed and there was a familiarity to the goal. Nicholson swung a deep corner towards the back post where Ozturk met the ball with a towering header. Goalkeeper Tomas Cerny managed to somehow keep the ball out but Sow was on hand to turn the rebound in from close range. There was little respite for the visitors and by the interval all they had managed to collect from their work was two bookings. Anxiety was quick to impose itself on Thistle again after the break with Hearts spurning a clear chance to add to their lead when Morgaro Gomis broke upfield and split the visitors' defence to find Nicholson but with only Cerny to beat the winger pulled his shot just wide of the far post. Juanma was a threat throughout with his powerful running and deft touches but his finishing tended to be awry. He made room for a shot inside the penalty area but after a sharp spin on the ball he lifted his effort over. Even a spot-kick was spurned - after Paterson had been tripped by Stuart Bannigan - with the the Spaniard's effort pushed away by Cerny. Nicholson was quick to react, though and turned in the loose ball. Juanma eventually found his finishing touch and atoned for the miss moments later when he outmuscled Frederik Frans, ran through on goal and lifted a delicate effort over Cerny. There ought to have been a fourth goal when Gavin Reilly found space inside the area but his curling effort was pushed round the post by Cerny. Partick Thistle are the latest team to find Hearts too strong and imposing. Match ends, Heart of Midlothian 3, Partick Thistle 0. Second Half ends, Heart of Midlothian 3, Partick Thistle 0. Billy King (Heart of Midlothian) wins a free kick in the attacking half. Attempt missed. Gary Fraser (Partick Thistle) right footed shot from outside the box is just a bit too high from a direct free kick. Corner, Partick Thistle. Conceded by Callum Paterson. Substitution, Heart of Midlothian. Callum Morrison replaces Juanma. Corner, Heart of Midlothian. Conceded by Tomás Cerny. Corner, Partick Thistle. Conceded by Jordan McGhee. Attempt saved. Gavin Reilly (Heart of Midlothian) right footed shot from the centre of the box is saved in the bottom right corner. Corner, Partick Thistle. Conceded by Alim Ozturk. Attempt blocked. Steven Lawless (Partick Thistle) left footed shot from outside the box is blocked. Corner, Partick Thistle. Conceded by Sean McKirdy. Attempt blocked. Abdul Osman (Partick Thistle) right footed shot from the right side of the six yard box is blocked. Corner, Partick Thistle. Conceded by Billy King. Attempt missed. Juanma (Heart of Midlothian) right footed shot from the right side of the box misses to the left. Declan McDaid (Partick Thistle) wins a free kick on the left wing. Attempt missed. Kris Doolan (Partick Thistle) header from the centre of the box is close, but misses to the right. Callum Booth (Partick Thistle) wins a free kick on the left wing. Substitution, Partick Thistle. Declan McDaid replaces David Amoo. Substitution, Heart of Midlothian. Sean McKirdy replaces Prince Buaben because of an injury. Goal! Heart of Midlothian 3, Partick Thistle 0. Juanma (Heart of Midlothian) right footed shot from the centre of the box to the high centre of the goal. Assisted by Sam Nicholson. Goal! Heart of Midlothian 2, Partick Thistle 0. Sam Nicholson (Heart of Midlothian) right footed shot from the centre of the box to the bottom right corner following a set piece situation. Penalty Heart of Midlothian. Callum Paterson draws a foul in the penalty area. Penalty conceded by Stuart Bannigan (Partick Thistle) after a foul in the penalty area. Substitution, Heart of Midlothian. Billy King replaces Osman Sow.